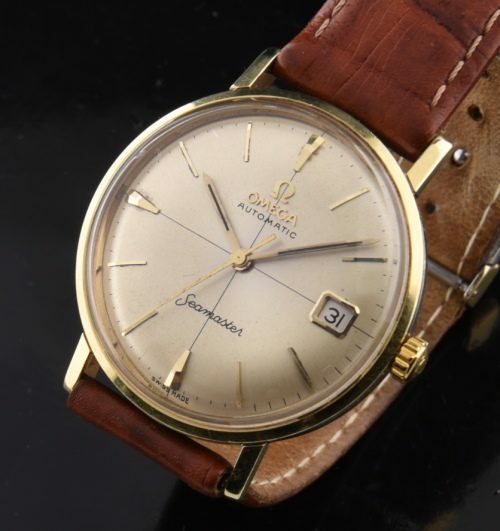 This is an early 1960’s OMEGA SEAMASTER having an original and VERY CLEAN and attractive quadrant dial with arrow markers and pencil hands, all with black inset. We are finding fewer of these quadrant dials these days. the automatic winding movement was just cleaned and is accurate. The gold filled case with steel raised sea monster embossed case back was never polished and really looks amazing for its age-no major dings or scratches. This is a highly reliable classic looking vintage OMEGA you can wear and hand down to the next generation. Look at this quadrant dial!